The fresh air of the mountains. The lush green forest. The smell of homemade pasta served with local wine. The “Dolce Vita” is real and it’s waiting for you in Borno, Northern Italy. 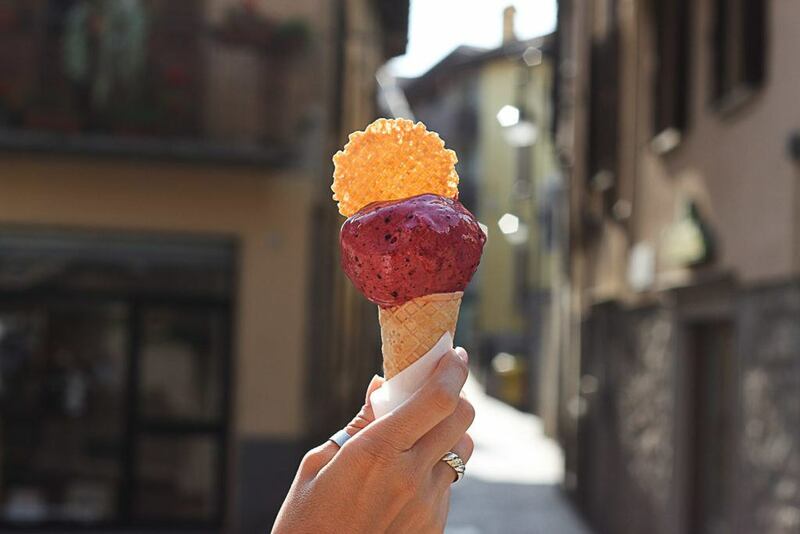 This charming city is the truly Italian experience, with gelato and aperitivo. The list of what to do in Borno is big and the best part is that you won’t need to share space with tons of tourists like in Rome, Florence or Venice. That we like small towns in the mountains is nothing new, so when we had the chance to travel to Borno we didn’t think twice. This charming mountain town is a hidden gem in Italy. Be prepared to hear only Italian, try local recipes and drink fine wine while watching life goes by. If you have an adventurous spirit, there are many things to do in Borno that will keep you busy. Architecture and history are also some of Borno top attractions. We traveled to Borno with a bigger propose. After 10 years researching documents and tracing his Italian heritage, finally Rob was going to start his Italian citizenship process and Borno is the place he choose for it. 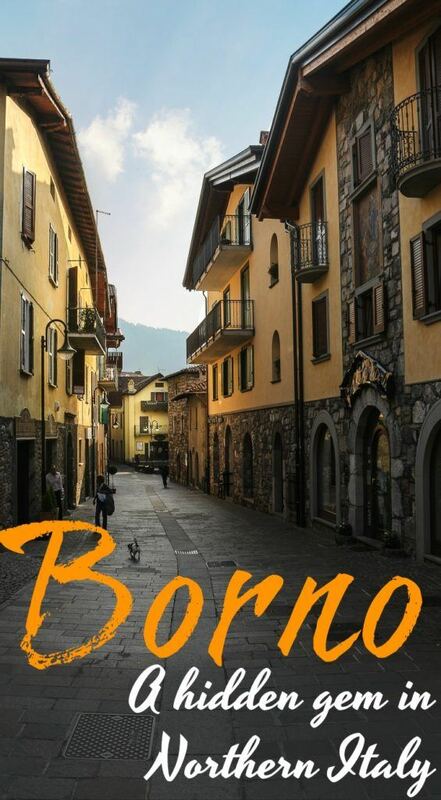 When is the best time to travel to Borno in Northern Italy? Any time of the year! The mountains are beautiful all year around and you can find what to do in Borno in any season. We were there during summer, in August we had sunny and warm days with fresh nights. Perfect temperatures to enjoy outdoor activities and sumptuous dinners. Spring and Autumn are also a good time to visit Borno, especially for hiking and cycling. Winter is skiing time! How many days in Borno? That’s a hard question to answer. It will all depend on what you want to do in Borno and your style of traveling. If you are traveling around Italy and visiting other places, I will suggest staying in Borno at least 4 days. So you have time enough to explore the mountains, visit the old town, eat good food and even visit some of the other villages nearby. 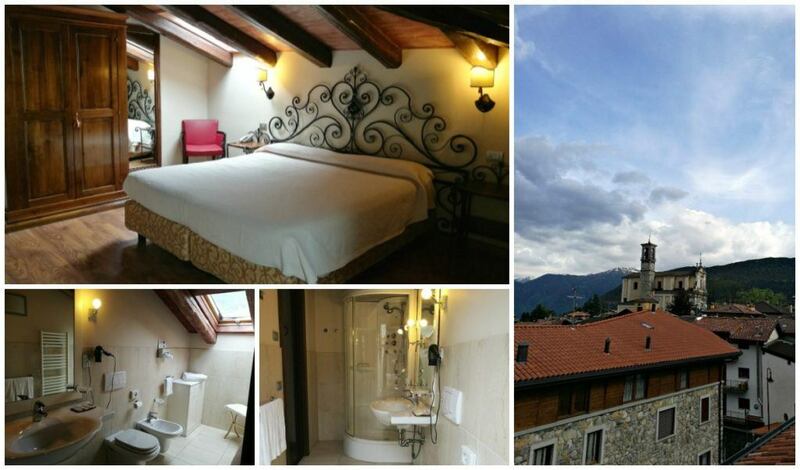 For those who want to relax and enjoy the Italian way of life, come and stay longer. If you have a car you can use Borno as a base and do day trips to explore the Val Camonica region where Borno is located. Where to stay in Borno? Borno is a small town, so you won’t find big hotels and resorts. What it has to offer are cozy mountain hotels, family guesthouses, and beautiful campings. On our first trip, we stayed at Linda Hotel that now is closed. 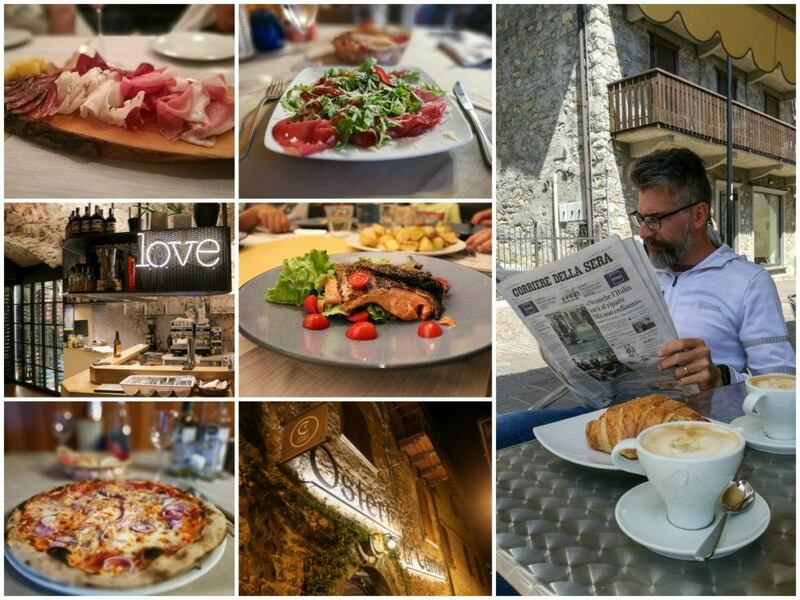 The second time we stayed at Albergo Venturelli, a charming and cozy 4 star hotel. The rooms are beautiful and comfy, and the bathrooms are huge. Our room was on the 3rd floor with stunning view of the mountains and the church tower, what made our stay even ore special. What we loved about this hotel is the location, in the heart of Borno historical town and some of the best restaurants are just around the corner. We also visited the Boscoblù Camping Village and it was love at the first sight. 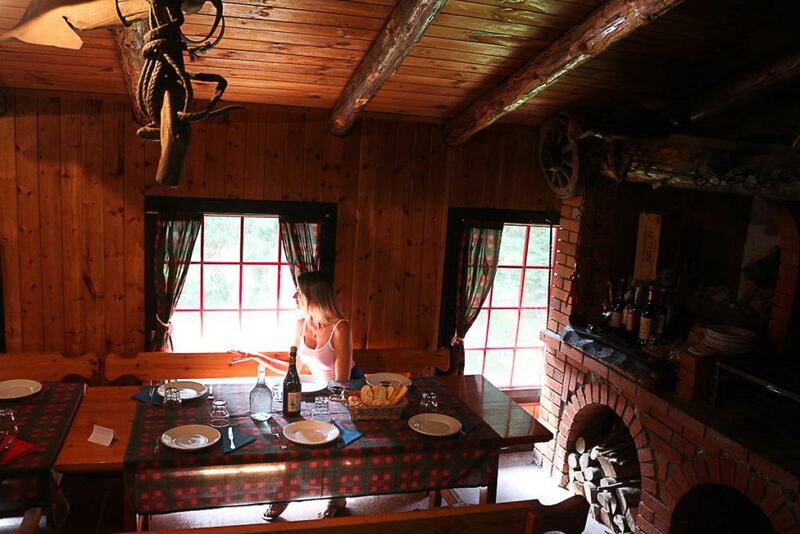 The chalets are so charming, all made of wood, equipped with everything you need to sleep, cook and relax. It’s a little house in the middle of the mountains, surrounded by trees and connected to the ski area. If you like nature and adventure this is the perfect place to stay in Borno, also it’s a great base for winter holidays. Boscoblù Camping Village is 2,7km from the old town, you can rent an e-bike to get around or walk as many people do. If you rent a car, then you are sorted. Want to stay at Borno old town? No worries, there are a few options of hotels in Borno. This Italian hidden gem is small in size but has many attractions to keep any traveler busy for a few days. In summer the days are longer, so you can do a lot while the sun is shining. Winter is the opposite, you will need to wake up early to make the most of your day. Our suggestions of what to do in Borno includes nature, good food and drinks, I hope you like them as much as we do! You won’t get tired of walking the cobblestone streets of Borno. The historical buildings are gorgeous, with flowers hanging by the windows and colored doors. In the main square is the church, the fountain, the city hall and lovely cafes. This is where everything happens in Borno, so sit and be part of the Italian Dolce Vita. While walking around the old town, pay attention to the tourist signals to learn more about the medieval buildings and the history of Pope John Paull II that visited the city. The city tour is not complete without a stop for gelato and a cappuccino, but we gonna talk about this later on. The food in Borno deserves a special chapter. Doesn’t matter if you are an avid hiker, a mountain runner or just someone that likes to walk in the middle of nature. One of the top things to do in Borno is hiking, from easy trails to mountain hikes that will take your breath away. There are many hiking trails in Borno, at your hotel ask for hiking maps, or even better, talk to people and ask their favorite hiking trails. I’m sure you gonna discover amazing places that is not in the maps. Bring a comfy pair of hiking boots or runners, hat, sunglass and sunscreen. Pack water, fruits and go for a day in the mountain. Along the hiking trails there are some Rifugio, local restaurants and B&B that serve delicious food and are also a resting point for the adventurous travelers. Borno has a lot to offer to running enthusiasts. 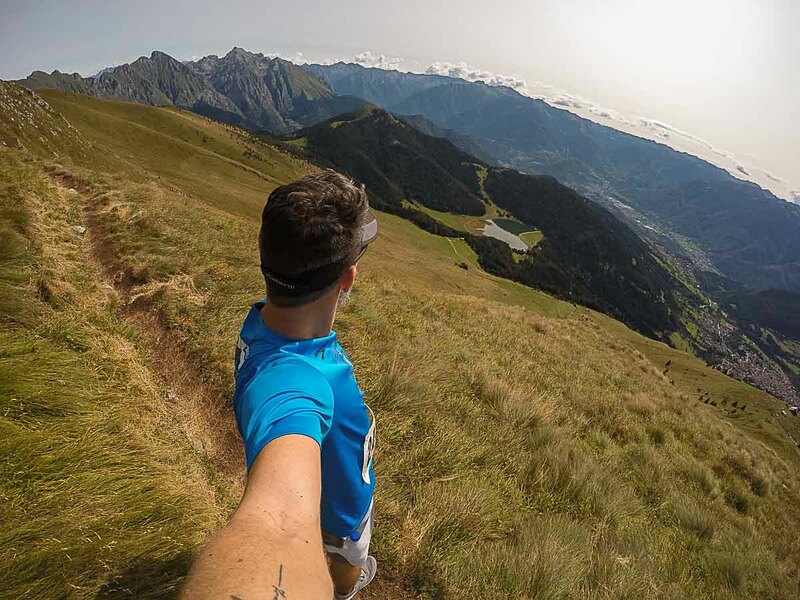 In August happens the San Fermo Trail, a 23 KM mountain run that will make you sweat and fell in ecstasy for running in such a marvelous place. As you might know, Rob is a runner and while traveling he already raced the Paris Marathon, the Angkor Wat Half Marathon in Cambodia, the Singapore Marathon, the Ironman in Malaysia and he is training for the Ironman 70.3 Thailand. After two days in Borno he saw the San Fermo Trail advertisement and he decided to race it. He had no time to prepare his body and mind for such a challenge, but he did it anyway. It was an incredible and tough experience. Lombardy region in Northern Italy is the address of famous lakes as Lago di Como and Lago di Garda. They are beautiful and also super touristic. Borno has a lake too, smaller but super pretty. Lago di Lova is located a bit outside of the town and it is one of the top places to visit in Borno. If you don’t mind a walk uphill you can go there by foot, or if you prefer drive there and enjoy the afternoon by the lake as the locals do. What to do in Borno in winter time? The answer is: spend the day at the Monte Altissimo. This ski area is only 3 km away from Borno old town and you can go there by car, by bicycle or walking. The slopes are at 1700 meters above sea level and there are pistes for beginner to professional skiers. The best part is that you can enjoy the mountain and the lifts during summer too. The first part of the lift works all year around. You can go up and from there follow some of hiking trails or go for a nice meal at Ristorante Capanna Plai Rifugio-Museo. This picturesque restaurant serves local recipes and homemade liquor in a place that looks more like a museum than a restaurant. The vintage skis hanging on the walls and the old gramophones playing Italian songs are amazing. Even if you don’t ski or don’t like hiking, take the cable car and visit the Refugio Plai, it is an experience like no other. Every Wednesday the square on the top of the city receive cars and vans packed with the best and the freshest products from the Val Camonica region. Fruits, veggies, hundreds of different types of cheese, hams and salami. I was in paradise with all that sweet peaches, shiny tomatoes and smelly cheeses that taste like heaven. The weekly market it’s an experience you only can have in a small town like Borno, away from the bigs cities and tourists. The best time to visit the market is from 9 AM to 10 AM. In Northern Italy the traditional aperitivo is an attraction not to be missed. In most of the cities it only starts after 5 or 6 PM but in Borno is different. As from midday, the aperitivo is served and no one will judge you if you order a glass of sparkling wine in the middle of the afternoon. When you buy a drink [alcoholic or non alcoholic] you can eat from the buffet table, that usually has olives, slices of pizza, chips, peanuts and cookies. For 3 Euros [yes, a glass of wine or a drink costs only 3 Euros in Borno] you can drink, eat and have fun. That’s why the aperitivo is on the list of what to do in Borno, it’s cheap, delicious and you will be surrounded by locals. To be honest we join the aperitivo more than we should and no regrets. During the 15 days that we stayed in Borno we did a big research for the best Campari Spritz and it was hard to choose. The bars at the main square are the best bet for a local feeling and a mix of old and young Italians. If you want to drink in the middle of the day and also try some nice pastries the La Forneria Rigali in the beginning of the pedestrian street is a good option. 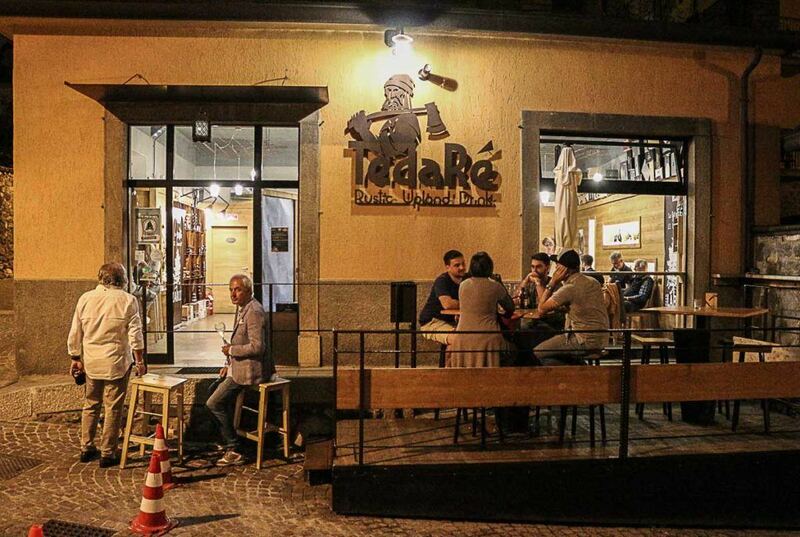 The young crowd meets at Tedaré, our favorite place for Campari Spritz and cheese board. At the traditional bars you have a buffet where you can choose some snacks and finger food. In Tedaré is different, you order your drink and you get a board with local prosciutto or salami. It’s always a yummy surprise. Our favorite drinks there are Campari Spritz, Hugo and Upland. For a late night out and some music head to the Rock & Blues Bar. The Leffe Blond from the tap is one of the best sellers. If you stay in Borno a bit longer take time to visit the other towns and villages. There are many charming towns in the mountains and bigger cities down in the valley. During summer some of the towns organize the traditional Sagra, a local festivity with food, music and handicrafts. Bienno has the Mostra Mercato, famous among art and music lovers. Ristorante & Pizzeria Piandass was our everyday restaurant and I love everything there. It’s simple with honest and delicious food. The restaurant is run by Domenico and his family what gives you the feeling of eating in a friend’s house. It’s a small restaurant, so after your first visit get their phone number and reserve a table for the next lunch or dinner. The food is always fresh and the menu changes according to what they have in the kitchen. Our favorites: gnocchi with butter sauce and grana padano cheese, the pasta with boar ragù sauce, bresaola with rockets and grana padano cheese, and the tuna & onions pizza. I’m missing Domenico’s food so much. The beautiful decoration and the menu will surprise you! The restaurant is in an old building and the stone walls create an interesting contrast to the modern decor and kitchen. On the menu traditional Italian food served with a twist, resulting in dishes that you will dream about. People from all region come to the Osteria Al Cantini for a great meal, so don’t forget to book your table in advance. If you love meat, you must try the Fiorentina and for those who are a bit tired of pasta and pizza, the house hamburger is to die for. Honestly, one of the best burger we have eat, the patty is thick, juicy, cooked to perfection and served with delicious cheese and bacon. While Rob fell for the burger, the Osteria Al Cantini won my heart by the desert. If you are up for something different try the fig gelato com crescenza cheese. A mix of sweet and savory that is among one of my favorite desserts ever. In Borno the food is gorgeous but we couldn’t have a big meal every lunch and dinner. For us a quick bite at midday and a good dinner was the perfect balance. If you need a snack during morning or afternoon the three bakeries in the old town will give plenty of choice from small pizzetas, focaccias, savory or sweet brioches and paninos. Now the best part of where to eat in Borno: gelato! There are 3 gelato shops in Borno old town, all them are good, but we do have our favorite one. And before we mention the best gelato in Borno I need to tell you one thing: it’s ok to eat 4 or 5 gelatos per day, you are on holidays! Back to the best gelato, our favorite is the pistachio from the Gelateria Incentropercento on the top of the old town close to the parking lot where the Wednesday market happens. Pistachio is followed by Nocciola [hazelnuts], Nocce [nozes] and Fior di Latte [that’s a kind of milk cream]. But don’t follow only our recommendations, one of the best things to do in Borno is to try as much gelato as possible and find our your favorite ones. Borno is located in Val Camonica region in the Lombardy province, Northern Italy. It’s close to Switzerland and the mountain landscape is very alike. Huge rocky mountains, ski resorts and good food, but in Borno the price is way cheaper than in the Swiss Alps. To travel to Borno is not that easy, but totally worth it! Milan has the biggest and most well connected airport close to Borno. Use Skyscanner or Kiwi.com to find the best flights and connection. Milan has three airports so you have plenty of options for international or domestic flights. From Milan airport you can rent a car and travel across the Val Camonica and Borno on your own pace. Search for the best car rental prices here, book your car in advance and start your trip in northern Italy hassle free. If you don’t want to drive, another option is to take the train from Milan to Brescia. From Brescia there are daily trains to Breno town. From Breno you can get a bus or a taxi to Borno. This trip would take approximately 4 hours, not super fast, but totally doable! We were traveling from Hungary to Italy by bus, we arrived in Brescia early in the morning and took the train to Breno and then a ride to Borno. Now you know what to do in Borno, where to stay and how to get there. This is the ultimate guide to Borno, one of Italy’s best kept secret. Borno is a place to be discovered and that will give you the real Italian experience. 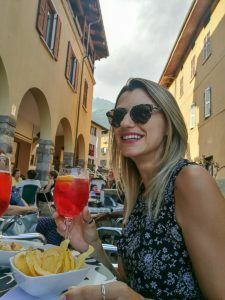 If you are planning a trip to Italy you must add to your Italian itinerary a visit to Rome [check out this super guide to the best things to in Rome] and a visit to Florence [read our guide of what to do in Florence in one day, best museums and places to visit].